Background: The chaperone activity of α-crystallin (α-Cry) plays an important role in maintenance of eye lens transparency. Various mutations in the α-Cry genes have been indicated to cause cataract diseases in human. Also, the calcium imbalance has been shown to induce aggregation in α-Cry. We investigated the impact of calcium ion on structure, chaperone activity of the recombinant wild-type and mutant R12C αA-Cry. We suggested that the raise of calcium level in eye lens is an additional contributory factor accelerating the development of cataract diseases in patients with R12C mutation. Objectives: The main objective of this study was to investigate the impact of calcium ion on structure, chaperone activity and amyloidogenic properties of the recombinant wild-type and mutant R12C αA-Cry, in a comparative study. Methods: The mutagenesis was performed on confirmed αA-Cry cDNA in pET-28b (+) which applied as a template to generate R12C mutant, using polymerase chain reaction (PCR) and a Quick Change Lightning Multi Site-Directed Mutagenesis kit (Stratgene). Both wild-type and mutant plasmids were chemically transformed into E.coli BL21 (DE3) and the respective recombinant proteins over-expressed in LB broth. The protein purification was done using Q-Sepharose anion exchange and Sephacryl S-300 gel filtration chromatography. The purified αA-Cry samples were incubated with different concentrations of calcium ion (0-40 mM) at 37 °C for 1 week. The secondary and tertiary structural analyses of each protein were performed by far-UV CD and Try/Trp and ANS fluorescence assessments, respectively. The assessment of chaperone activity was done spectrophotometrically in both thermal and chemical-induced aggregation systems using γ-Cry and bovine pancreatic insulin as the substrate proteins, respectively. Also, the amyloidogenic properties of proteins was investigated by CR absorption and ThT fluorescence measurements. Results: The results of fluorescence and CD assessments suggested the significant secondary and tertiary structural alterations upon R12C mutation. R12C mutant αA-Cry demonstrated preserved secondary and tertiary structures in the presence of calcium. 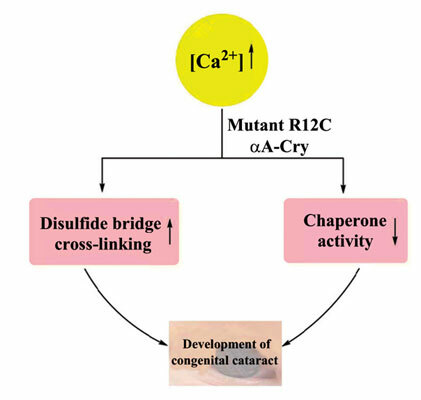 The chaperone activity of wild-type and mutant R12C αA-Cry was reduced in the presence of calcium. Also, the extent of chaperone activity reduction was significantly higher for R12C αA-Cry. Both wild-type and mutant R12C αA-Cry revealed slight amount of aggregation when incubated with different calcium concentrations for 1 week, at 37 °C. However, the susceptibility of both proteins for aggregation was significantly increased in the presence of 40 mM calcium, at the elevated temperature (60 °C). Also, the mutant protein exhibited extensive disulfide bridge cross-linking as indicated by gel electrophoresis. Moreover, the mutant R12C αA-Cry significantly resists against amyloid fibril formation in the presence of calcium ion compared to the wild-type protein as indicated by CR and ThT assessments. Conclusion: Our data suggested that αA-Cry conformational changes occurring upon R12C mutation and further functional damages induced by calcium may play an important role in the pathomechanism of the cataract development by this mutant protein. αA-crystallin (αA-Cry), cataract, mutation, calcium, chaperone, aggregation.